Come join the party with Abby and her elephants! 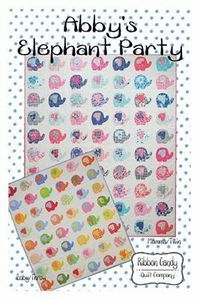 Each quilt uses fusible web applique for the elephant images There are two sizes of templates, momma and baby. Both are actual size. *This quilt is named after a brave little girl named Abby (7 years old) who has had heart problems since birth. Her favorite animal is an elephant. Momma elephant quilt measures 77" x 90". Baby elephant quilt finishes 48" x 56".